Heat oven to 300°F. Grease 15x10x1-inch pan with shortening or cooking spray. In medium bowl, mix egg white and pecan halves until pecans are coated and sticky. In small bowl, mix sugar and cardamom; sprinkle over pecans. 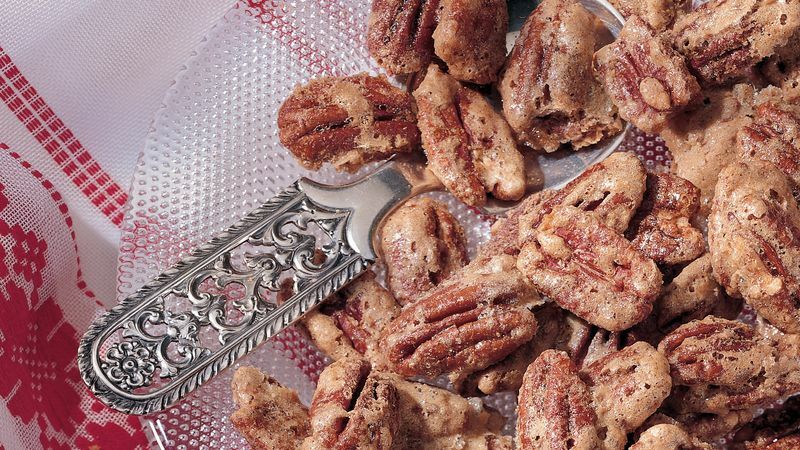 Stir until pecans are completely coated. Spread pecans in single layer in pan. Bake about 30 minutes or until toasted. Cool completely, or serve slightly warm. Store tightly covered up to 3 weeks. Ground cinnamon can be substituted for the cardamom; both spices are perfect for the holidays. Unique food gifts are such a nice surprise. A bag of these nuts along with an excellent blue cheese, bottled vinaigrette dressing and fresh pears is the start of a spectacular salad. All that's needed is the greens.